The A-Game Sports June Little Athletes Multi-Sport Camp is designed for boys & girls between ages 3 – 5. During the camp, your child will learn sports in a fun and engaging way! 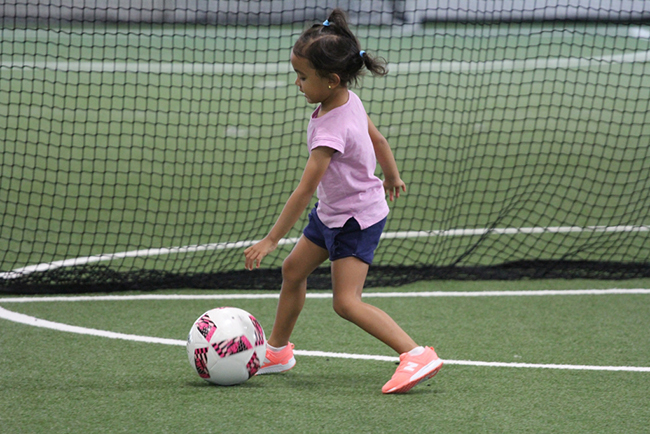 The A-Game Sports indoor facility is a safe environment where your child will have fun learning sports and many other valuable skills! Sports & Activities: Soccer, Wiffle Ball, Basketball, Relay Races, Dodgeball, Camp Games, Arts & Crafts, Bounce House & Much More! 5:1 Camper to Counselor Ratio! Register for one to four weeks. You do not need to pick the week(s) you will be attending camp until May 1st. See below for the prices of the Little Athletes June Multi-Sport Camp based on the date of registration. Prices increase as the start of the program gets closer. Participants must be potty trained. Children are required to bring lunch and snack. A-GAME SPORTS is not a peanut free facility. Children with peanut allergies are required to bring an EpiPen. Camp weeks must have a minimum of 5 campers enrolled in order to successfully run. Your child must have a signed release form and medical form completed by a physician in order to participate, including a records of immunizations and vaccines. All registration fees are non-refundable unless a doctor’s note is provided stating that your child is unable to participate in any physical activities during available camp weeks. Any questions, please feel free to call A-GAME SPORTS at 914-278-9477 or email James, the director of the toddler program, at james@agamesports.net.